Each year many businesses suffer from downtime, fire and in extreme cases, injury through neglect and a lack of electrical maintenance. By law a company or landlord needs to have their electrical equipment tested for safety. 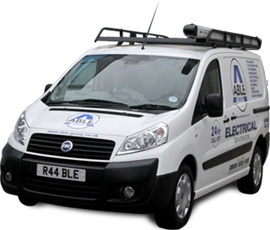 Able Electric can carry out electrical testing such as portable appliance testing that same day helping you become fully compliant with local authority and insurance requirements. Our electrical fault finding team are second to none and can be at your property within 30-90 minutes. We can be contacted 24/7 with trained staff helping you with any electrical query or free quotes and estimates for electrical testing surveys.